Published on October 18, 2011 in corruption, General T&T, Media, Politics and Sports. 8 Comments Tags: FIFA, Jack Warner, Politics, T&T Govt. Those who listened to the video recording which was promoted in the London Telegraph last week and chose not to be duped by the pressures of foreign interpretation and anti-Jack Warner sentiments, would realise by now that what was supposed to be an exposé of Jack Warner, simply fell flat. The truth is that there is much to be told about how the FIFA conducts its business and I have promised in the past a tsunami that would hit the FIFA, and indeed, it will come. To the detractors who want to predict time, place and circumstance for this tsunami let me advise all that, in the fullness of time, it will come, but definitely not before Mr Bin Hammam’s case before the Court of Arbitration Sport (CAS) is resolved. In short course, I will be speaking out about my role in the FIFA and the changes I sought to bring about while I served its membership as member of its executive committee and subsequently as one of its vice presidents during the 29-year period from 1982 – 2011. I will talk about the bitter elections for the FIFA presidency in 1998 when Sepp Blatter faced his most telling rival in Lennart Johansson and the detailed reason for the support which was offered to him by both Mohammed Bin Hammam and me. We took him on a worldwide crusade through Africa and Asia begging for support for him, and he won! That was the first time I met the present deputy chairman of FIFA ethics committee, Petrus Damaseb, at the time the president of the Namibia FA. I will tell the world what gift Bin Hammam gave to him which was not a bribe then as he has ruled today. With Bin Hammam’s private plane, we did the same for Blatter again in 2002 when he faced Issa Hayatou, in a most brutal election, and he won—a second time. I will talk about the discussions, which Bin Hammam and I held with Blatter following the 2002 elections, asking him to change the image of the FIFA. I will reveal the circumstances under which I told Blatter that “blackness in football must not be only on the field of play but also on the field of the FIFA administration.” I requested the introduction of more persons of colour at the administrative level of the FIFA, which today still has more than 95 per cent of its staff of over 300 persons belonging to one race, one country, one continent. In my exposé, I will discuss the litany of broken promises made to me by Blatter who, instead of trying to include a larger number of persons of colour and other minorities within the administration of the FIFA, sought instead to placate me by assigning me to increasing numbers of FIFA committees and appointments. I will talk about the racism that is within FIFA. I will talk about the levels of religious discrimination which I sought to correct. I will talk about the Zionism, which probably is the most important reason why this acrid attack on Bin Hammam and me was mounted. These are just some of the issues of which I will speak as it relates to the FIFA. I will also tell you about the attempts I have made over the years, in my capacity as Deputy Chairman of FIFA Finance Committee, to find out the salary of Sepp Blatter, and in spite of serving on the Finance Committee for over 8 years, I have not been able, through the books or even through direct requests to him, to determine the quantum of money given to him for the office of the President of FIFA. The changes I sought to effect at the FIFA, I attempted to start within the CONCACAF and the Caribbean Football Union (CFU) when I brought Angenie Kanhai from the lowly paid salary serving as a stadium manager and positioned her as general secretary of the CFU. I will talk about how this change was to shift the paradigm of perception that football is a male-only, African-centred sport by introducing a woman of East Indian descent at a managerial position within the CFU, as a first measure. I will also give you detailed accounts of the conspiracy against the CFU by one of its own, who secretly videotaped that meeting for Chuck Blazer and was rewarded with an office in Miami and a higher salary and who unilaterally moved the CFU’s 33-year-old office from Port-of-Spain to Miami so that every Caribbean official wanting to do football business in the Caribbean had to get a US visa. You will also understand why ingratitude is worse than witchcraft. The role of Blazer in the CONCACAF will be exposed. His addiction to the stock market and how this impacted on the CONCACAF’s finances will all be revealed. You will also be told why for some seven years I refused to sign Blazer’s contract and even today as I write to you he has none. You will learn why Blazer became vice-president of CONCACAF ahead of Sunil Gulati, the present president of the USSF. His wheeling and dealing will stymie the international football community; it is no wonder he has signalled his intentions to leave his CONCACAF post. It is only when the tsunami hits that the global village will you understand why he has done all in his power to deny Lisle Austin of his right to the post of acting president at CONCACAF because he is quite aware of what a five-year audit into CONCACAF will reveal about him. There is much to talk about that will make the sponsors of both the FIFA and CONCACAF cringe with painful surprise. The vindictiveness of FIFA, not only against me but also against all others associated with me will be exposed. The FIFA has tried to muzzle me with threats of a worldwide suspension. They have said that they will close down the FIFA Development Office in Trinidad by year-end. They have advised that they will terminate my son’s 2012 contract at the end of this year. They have retaken the World Cup TV Rights first given to me by the former President of FIFA, Dr Joao Havelange, a matter for which they have not heard the last. They have refused to give me any of my 29-year pension. They continue to do such things like leaking a video in the hope that they can embarrass me to lie down on my belly. Never, I repeat, never, regardless of the consequences. Let me assure all that the promised tsunami will come. All the real “gifts” that Blatter gave to secure his two elections will turn stomachs inside out. The conspiracy to protect the FIFA’s throne for Michel Platini by getting rid of the Muslim Bin Hammam and the interruption of the successes of Jack Warner will be uncovered for all to see. Of the eight FIFA Presidents, only one was not a European—Dr Joao Havelange was Brazilian. Three were English, one was Belgian, the incumbent is Swiss and two were French. Is it that people of colour cannot administer football? Or is it that only Europeans possess the skill to do so? Is this why Platini is being groomed as heir apparent? For the last FIFA election, the last count before the election showed that Blatter had 90 votes and Bin Hammam had 85 in a 209 FIFA membership. Whoever got 105 votes would have won. CONCACAF has 35 votes of which the Caribbean has 25. It would have been an interesting encounter until the region was sold out to Blazer and Blatter. Even after Blatter had paid for a private plane for me to meet him in Guatemala to a midnight meeting I refused to give him CONCACAF’s public support as all of the other Confederations except Asia. Today the Caribbean is paying the price for standing up! What is now even more interesting is that in spite of being a senior FIFA official for 23 years and serving as the FIFA’s 8th president for a period of 13 years, Sepp Blatter now suddenly sees the need to reform the FIFA from within in his last term of office and in the sunset of his days. This is hypocritical to say the least for it is public knowledge that his four terms of office have been dogged with controversy and allegations of corruption to which he has never responded. Why now I ask? But of this I will have much more to say. WORKS and Infrastructure Minister Jack Warner yesterday lashed back at his critics in the wake of the re-emergence of FIFA bribery allegations, making plain that he is not in the political dog-house. “The Honourable Prime Minister is not a dog or a dog-lover for that matter,” he added. “But she does love Trinidad and Tobago and humanity. That is why we will survive!” Rin Tin Tin was a famous German Shephard rescue-dog adopted from a World War I battlefield who went on to star in several Hollywood films. Lassie is a fictional collie dog, featured in films, novels and a short story, famed for rescuing. Warner was responding to mounting pressure on him from the Opposition benches and civil society over allegations of bribery which re-emerged last week with the leaking of a Fifa videotape. Warner said there is always speculation over his fate, and his place in the Cabinet is sometimes linked to superficial indicators such as allocation levels and his position in relation to the Prime Minister in Cabinet and elsewhere. He said he can turn his back on politics any day and does not have to “sing for his supper”. “I came here with my meals already prepared,” he said at Tower D, Wrightson Road, Port-of-Spain. Warner attacked Opposition Leader Dr Keith Rowley for saying the planned infrastructure bank would be given to the Chaguanas West MP to run. He said Rowley should have looked up the concept of the bank on Google, the popular internet search engine. “You did not even know what it was,” he told Rowley. FIFA is inherently corrupt and no diffrent than the International Olympic Committee. I am happy that Warner is no longer a part of that organisation. The head of FIFA should have stepped down years ago, instead he wheels considerable power and influence over the organisation and does whatever he wants. As for the bribery scandal it may have been the only way to replace Sepp but that was not necessarily the best way. Bribery is always wrong. I am sure it was a learning experience for Jack. Agreed, FIFA is inherently corrupt but you do not ‘cross the line’ as Jack Warner did. The mistake Jack Warner made was not supporting the Prince of England when England needed the critical votes from the Caribbean basin to hold the World Cup in England. Jack fooled the Prince into believing that England would get his votes. He never followed through. This organization is controlled by wheelers & dealers, and is highly political. You must ‘play ball’ their way or else. Once you bite the hand that feeds you in this organization, you will pay the price. PLease tell me what does Sepp Blatter have to do with the allegations made against Mr. Warner. Here he is shamelessly trying to shift blame for his long list of indiscretions on Blatter, Blatter is not responsible for breaking our Laws, by bringing all that US cash into the country, and my question is who did the rest of it go to?,and here it is that another diversion is created with the Calder Hart/Manning Issue, Jack will never resign because he thinks he is the biggest man in the world,but deep down he is just and will always be a little man. No civilised and God-fearing person will kick a man when he is down or on his way there but Jack Warner it must be said that you brought all of this odium and ridicule upon yourself and by extension upon black people. You were in such a position to do good, unselfishly and for the Glory of God. But mammon became your idol. Reading your ramblings I now better understand why Kamla is showing you so much pity of late (she having seen this insight before we did, what a revelation) and prefers to go down with you, an albatross around her neck. You helped her almost single-handedly to fulfil her Karma of becoming the Prime Minister of Trinidad and Tobago, the first woaman at that, although it is clear to the “seeing eye” that greed was amomg your motives. 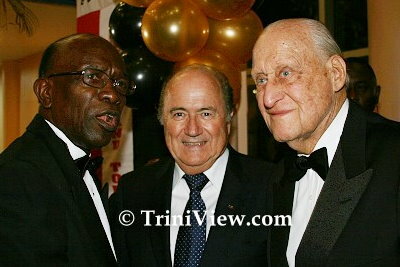 But, Trinidad, Jack Warner, and get this clear, was not called La Trinity by accident. A well-protected land this. It is clear from the tape (not that we didn’t know before) that neither conscience nor piety is among your traits. You are one of those foolish persons who feel that the Holy Spirit can be bribed or fooled or is impressed with much earthly possession and that God’s memory can, with time, be erased, fade away or be clouded. The Akashic Record is there, as a gentle reminder for you and other like-minded ones, that the memory of the Holy Spirit can never be erased nor tampered with. What you sow, Jack Warner, is what you are going to reap, that’s the immutable law, and you, Jack Warner, from the vibes that I am getting, having regard to the decisions you have already taken and the course you have decided upon, you are going to reap the whirlwind. In my exposé, I will discuss the litany of broken promises made to me by Blatter who, instead of trying to include a larger number of persons of colour and other minorities within the administration of the FIFA, sought instead to placate me by assigning me to increasing numbers of FIFA committees and appointments. I will talk about the racism that is within FIFA. I will talk about the levels of religious discrimination which I sought to correct. I will talk about the Zionism, which probably is the most important reason why this acrid attack on Bin Hammam and me was mounted……..Quote. Jack playing the race card this from a man that called Mr Manning a “racist” etc, now ad the “Zionist” paranoia talk from him and you would think Jack & Bin Hammam was long time friends fighting for the rights of the “Palestinians” etc (but silent on the mass killings of Africans in Sudan, Chad, Kenya and recently in Libya) I notice David Mohammad NEVER mentions on the radio that the Saudis they worship only stopped African slavery after the US & British Christians placed diplomatic pressure on the Saudis to stop having black African MUSLIM slaves in the 1960’s!